JIAMCATT is the International Annual Meeting on Computer-Assisted Translation and Terminology, a IAMLAP taskforce where most international organizations, various national institutions and academic bodies exchange information and experience in the field of terminology and translation. 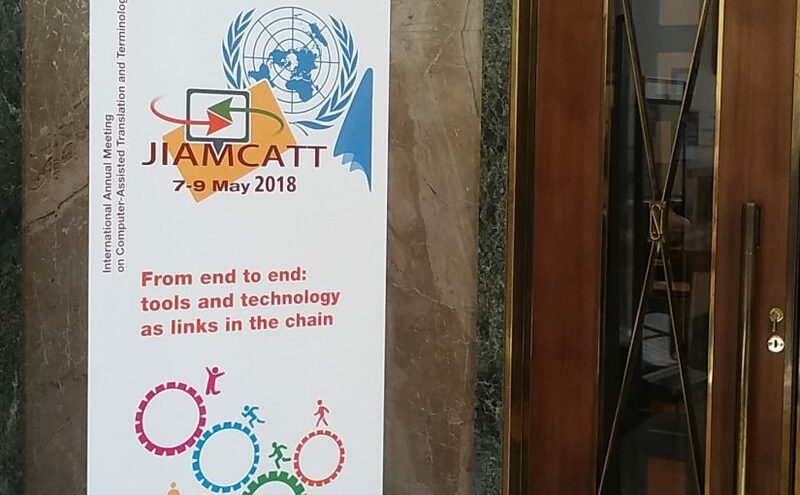 For this year’s JIAMCATT edition in Geneva, I had the honour of running a workshop on Tools for Interpreters – and idea I found absolutely intriguing, as the audience would not necessarily be interpreters, but translators, terminologist and heads of language, conference and/or documentation services. So I chose a hands-on workshop setting called „an hour in the shoes of a conference interpreter“. Participants had to prepare a meeting using different tools and would then listen to a 10 minute sequence of this meeting and see how well they felt prepared. Scenario 0: Interpreters haven’t received any documents and hardly any info about the conference. They have to guess and prioritise more than those working under Scenario 1. Scenario 1: Interpreters have received all the documents one hour in advance (quite realistic a scenario, as Marcin Feder from the EP pointed out). InterpretBank, a Computer-Aided Interpreting tool that covers many elements of an interpreters‘ workflow, like glossary creation, multi-dictionary search, term extraction, document annotation, quick search in the booth and flashcard learning. InterpretersHelp, a cloud-based Computer-Aided Interpreting tool that allows online shared glossary creation, glossary sharing with the community, manual term extraction and flashcard learning, as well as document and job management. At the end of the exercise, the participants watched the EP Special Committee on the Union’s authorisation procedure for pesticides on April 12, 2018 of the committee meeting. What followed was a lively and inspiring discussion, where each group described their workflows and how efficient they thought it was. Those who had the relevant documents and ran them through the OneClick term extraction found that most critical terms that came up in the speech were in the extracted list. Others found the relevant documents by way of internet research and did the same. Quickly installing programs or creating test accounts didn’t work out as easily for everyone, so some participants reverted to creating glossaries – common practice in the „real world“ – and felt well prepared with that. Ten terms of their glossary were mentioned in the 10 minute video sequence. Others spent so much time familiarising themselves with the new tools that they didn’t feel well prepared but were very happy with what they had seen of InterpreterHelp and OneClickTerm. When it comes to preparing for an EU meeting – at least when working from and into EU languages – there is an abundance of information available on the internet. It became clear once more that EU interpreters, in terms of meeting preparation, live in paradise. The EP legislative observatory, IATE and Eurlex were the main sources of information mentioned. I was happy to learn from Mariangeles Torrent (SCIC) that Prelex has not disappeared, but simply has turned into a tab within Eurlex named „legislative procedures„. A short discussion about the pros and cons of Eurlex led to the conclusion that for interpreters it would be wonderful to have more than three languages displayed in parallel, and possibly a term extraction feature or technical terms highlighted in the text. Josh Goldsmith had the news that by adding a hyphen plus the language code in the url of the multilingual display, a fourth, fifth etc. language can indeed be added, although the page layout is far from perfect then. For the moment I have decided to stick to the method I have been using for over ten years, which consists of copying and pasting the columns into an Excel spreadsheet. I was very glad to hear one participant mention the word „thinking“ in the context of conference preparation. He looked at the agenda and the first thing he did was think about what the meeting might be about. He then did some background research in Wikipedia and other sources and looked up product names, which actually were mentioned in the speech. He also checked who were the members of the committee, who didn’t appear in this part of the meeting, but would otherwise have been useful. While terms and glossaries were clearly the topics most intensely discussed, it became clear that semantic and context knowledge is crucial for interpreters to get a grasp of the situation they are working in. For as much as I appreciate a list of extracted terms from a meeting document as a last minute preparation, there is no such thing as understanding the content people are referring to. Hence my enthusiasm about the fact that the different semiotic levels (terms, content, context) did come up in the discussion. And indeed the notes I took while listening to the speech reflect the same thing: sometimes my doubts or reflections were simply about terms (how do you say co-formulant or low risk active substances in German), some about the situation (Can beer and talc be on the list of basic substances? Is the non-native speaker sure that this is the right word?) and some about meaning (What exactly is a candidate for substitution?). It was also very interesting to see how different ways of preparing a meeting turned out to be useful in the meeting. Obviously, there is not just one way to success in meeting preparation. Among the software features participants would like to see to support the information and knowledge work in conference interpreting, there seemed to be a wide consensus that term extraction and markup of glossary terms in meeting documents – like InterpretBank and Intragloss offer – are extremely useful. Text summarisation was also mentioned. Several participants found InterpretBank’s speech to text integration (based on Dragon) very interesting, but unfortunately, due to practical restraints we couldn’t test this. When it comes to search functions, it is crucial that intuitive searching is possible in the relevant (!) documents and sources. Relevance seems to be an important factor in conference preparation. What with the abundance of information available nowadays, finding out what is really useful is key. However, many of the big international organisations like EU, UN and WTO do have very useful document management systems in place which help to find one’s way around. From a freelancer’s perspective, I think that organizations should rather go for browser-based, i.e. device-independent systems to support their interpreters. This lowers the entry barrier of having to install something on each computer, apart from facilitating mobile access and online collaboration. Although I must say that I do also fancy the idea of a small plugin that works in any software, like my most recent discovery, GT4T. At least as freelancers, we change settings so often (back and forth from personal computers to mobile devices, Excel sheets, shared Google docs, paper, institutional information management systems etc.) that a self-contained environment for conference interpreters is maybe too clumsy and unrealistic. After all, hotkeys seem to be back in fashion: I also heard from the WTO colleagues that they have developed a tool quite along the same lines, creating special hotkeys for translators. Backronyms are acronyms that used to be normal words and were re-interpreted later. While translators have a chance to think twice or recognise the word as a backronym because it is written in capitals, interpreters may struggle much more with this. It may take us a moment or two to figure out that the sentence „we need to do what PIGS do“ refers to a „Professional Interpreters‘ Gymnastics Society“ rather than an animal. Teresa Ortego Antón (2015): Terminology management tools for conference interpreters: an overview. In: Eleftheria Dogoriti Theodoros Vyzas (editors): International Journal of Language, Translation and Intercultural Communication, Vol 5 (2016), Editors: Technological Educational Institute of Epirus, Greece. 107-115.